The directed energy weapons market is projected to grow from USD 6.87 Billion in 2016 to USD 24.45 Billion by 2021, at a CAGR of 28.90% from 2016 to 2021. The directed energy weapons market report covers the forecast of the market and its dynamics over the next five years, while also recognizing the market strategies adopted by the key players, recent developments in the market, and countries with high growth potential for the market. The directed energy weapons market has been analyzed primarily on the basis of technologies, including high energy laser, high power microwave, and particle beam through the period of 2016 to 2021, considering 2015 as the base year. The market size estimations for various segments and subsegments of this market were arrived at through extensive secondary research, including government sources such as the U.S. Department of Defense (DoD); the U.S. Air Force website; company websites; corporate filings, such as annual reports, investor presentations, and financial statements; and trade, business, and professional associations, among others. All percentage shares, splits, and breakdowns were determined using secondary sources and verified through primary sources. All possible parameters that affect the market covered in this research study have been accounted for, viewed in extensive detail, verified through primary research, and analyzed to get the final quantitative and qualitative data. This data is consolidated and added with detailed inputs and analysis from MarketsandMarkets, and presented in this report. The ecosystem of the directed energy weapons market comprises manufacturers, distributors, and end users. The key end users of the directed energy weapons market are defense sector and homeland security. Key designers and manufacturers of directed energy weapons includes companies, such as Lockheed Martin (U.S.), The Raytheon Company (U.S.), Northrop Grumman Corporation (U.S.), The Boeing Company (U.S.), L-3 Communications Ltd (U.S.), and BAE Systems (U.K.). The directed energy weapons market is projected to grow from USD 6.87 Billion in 2016 to USD 24.45 Billion by 2021, at a CAGR of 28.90% during the forecast period. In recent years, the range of advanced offensive and defensive capabilities offered by smart weapons has made them an indispensable component of any military force. This has created an increased demand for directed energy weapons from various regions, such as North America, Asia- Pacific, and the Middle East. This has consequently resulted in increased R&D expenditure for the development of directed energy weapons. The directed energy weapons market is a highly dynamic and has high growth potential for several reasons, such as the changing geo-political dynamics of the global economy as well as the increasing incidences of armed conflicts, violence, and terrorism, among others. In this report the directed energy weapons market has been segmented based on application, technology, product, high energy laser system, and end-user. Based on product, the market has been segmented as lethal and non-lethal. 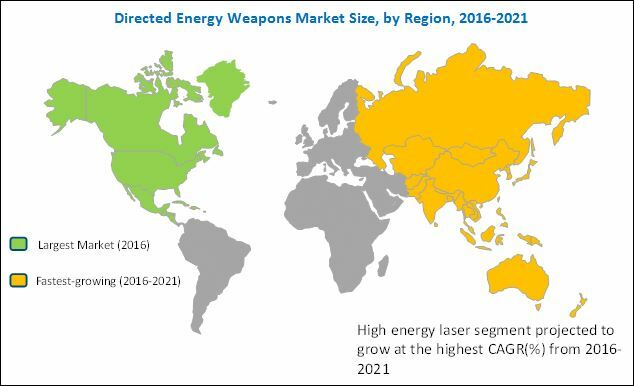 The directed energy weapons market, based on high energy laser systems, has been segmented into solid state laser, chemical laser, free electron laser, and fiber laser. The fiber laser segment is expected to witness high growth, due to the development of fiber laser technologies and microwave-based weapons such as active denial systems or pain ray weapons. Ongoing research and development activities, particularly in the high energy laser systems category, is one of the key factors expected to propel the growth of the directed energy weapons market. A majority of the companies operational in the directed energy weapons market are based in the U.S.
Asia-Pacific is expected to be the fastest-growing market for directed energy weapons market during the forecast period, since several Asia-Pacific countries such as India, China, Australia, and South Korea have made significant investments for research and development of directed energy weapons, such as active denial systems, laser dazzlers, among others. The growth of the directed energy weapons market may be restrained by factors, such as high development cost and susceptibility to degradation by external environments, including climatic conditions of directed energy weapons. The key players operating in the directed energy weapons market include Lockheed Martin (U.S), Raytheon Company (U.S), Northrop Grumman Corporation (U.S), Boeing (U.S), and BAE systems (U.K), among others. Long-term contracts and new product launches are the major growth strategies adopted by the major players to strengthen their positions in the directed energy weapons market. 14.9 L-3 Communications Holdings, Inc.
Table 4 Ongoing High Energy Laser Weapons Development Projects: U.S. Figure 39 Ballistic Missile Defense: Prime Focus to Develop Dew Technologies in the U.S.